August “Augie” Garrido has led his baseball teams to more victories than any coach in any sport in NCAA Division I history. He is also the winner of more National Coach of the Year awards than any other college coach. Garrido’s former teams at Cal State Fullerton and, more recently, at the University of Texas together have compiled a total of five College World Series championships under his leadership. But despite his unmatched record as a winner, Coach Garrido is not a win-at-all-costs coach. He teaches his players to focus on developing character, being good teammates, mastering all facets of the game, and playing with joy in the moment rather than focusing on the scoreboard. 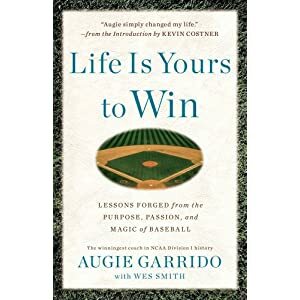 Augie teaches that the challenges faced in the batter’s box or on the pitcher’s mound are universal—and that the lessons learned on the diamond are applicable off the field, too. Life Is Yours to Win follows the coach’s journey of self-discovery and his evolution from being driven by fear to being motivated by passion. His unique and compelling book offers this revered leader’s philosophy on life and his thoughtful approach to helping young men understand both who they are and how they can be successful in their work, their relationships, and their communities. •BE A PLAYER, NOT A PROSPECT—If you want to be considered a star in your field, whatever that may be, you need to be fully engaged. Augie once had his Labrador retriever demonstrate the joy of play to a team that needed a reminder of why they loved baseball as children. •STEP UP, SUPERMAN—Augie stages a costumed Superhero Scrimmage each Halloween to remind his players that their inner superhero is just waiting for the perfect moment when preparation meets opportunity, potential is fulfilled, and destiny is realized. •THE FEARLESS FIELD—To be successful in the often cruel game of baseball, players must master fear and other emotions so they are energized rather than paralyzed. Augie once rented a hearse and placed a casket on the pitcher’s mound to help a slumping Cal State Fullerton team bury their fears and put losses behind them. •BUDDHA AT BAT—Bunting and other “small ball” skills are not as glorified as home runs and big plays, but Coach Garrido’s teams are known for putting players in scoring position and winning games by following a Zen-like philosophy of claiming small victories during each at bat, in each inning that add up to winning records. Augie’s coaching methods are unconventional, but his creativity and wry humor provide masterful life lessons. His insights will help you both on and off the field by providing fresh approaches to conquering fears, living with joy and passion in each moment, establishing personal principles, and appreciating the value of both losing and winning. This is a book by a beloved college coach but it is packed with Major League insights and anecdotes featuring many of baseball’s greatest players and most inspiring spirits. Life Is Yours to Win will appeal to anyone who appreciates the wisdom of a proven winner in sports and in life. Watch Augie discuss the book at: http://weareaustin.com/austinlive-story?nxd_id=144126. This book took a different approach to looking at sports, life, stress and much more in between. The author had a unique perspective seeing that he lived this life for many years! I loved the ideas and the way in which the coach deals with this type of stress and it is a testament to him, but also provides all of us with great ideas about how we all can live our lives in a different way. Many of us get too caught up in the drama and stress of daily life and the author of this book has you rethinking the way in which you may approach your day in the future. If you are a sports fan or player this book will definitely hit home for you, but the authors words are ones that will impact all who read. The book is well written and uses humor and down-to-earth examples to make the book one that I would highly recommend to all!